Some WIPS do not photograph well. These are among them, but lest you think I've been sitting around twiddling my thumbs, I must show them to you (okay, so I've been spending great gobs of time getting all the Adventure photos cropped and labeled, but I'm almost done with those, which is sad because once I finish blogging it then you're stuck with my relatively dull existence again). Anyway. BM's illustrated mat boards. The big one is done, the smaller one is in progress. Turkeys, a broiler, and some wysteria, all of which is symbolic and important to BM. 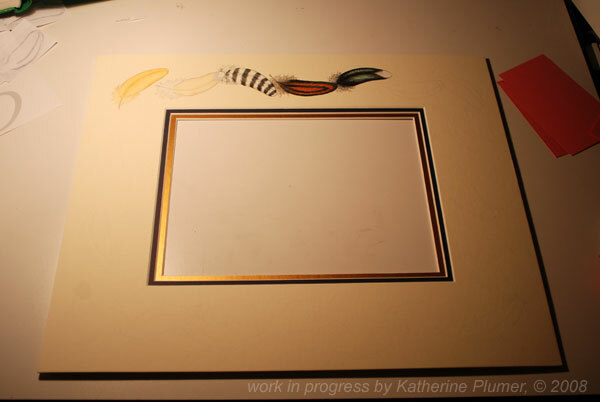 Feathers, assorted colors, nowhere near done. I framed "Jessie" today. 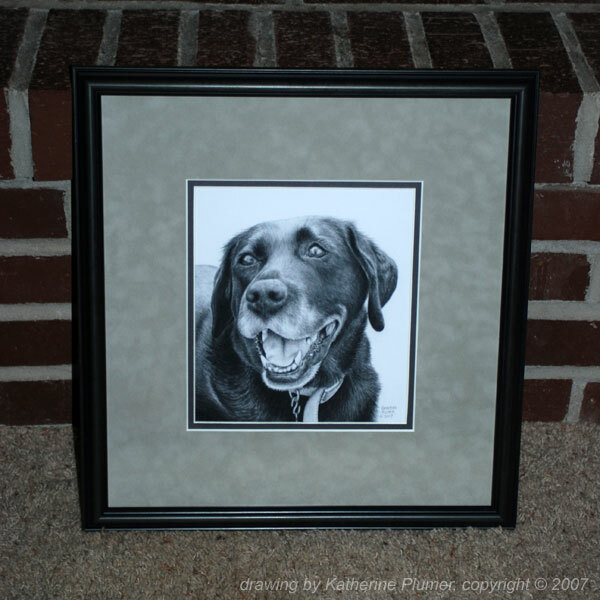 The drawing, not the real live arthritic deaf dog. I like! 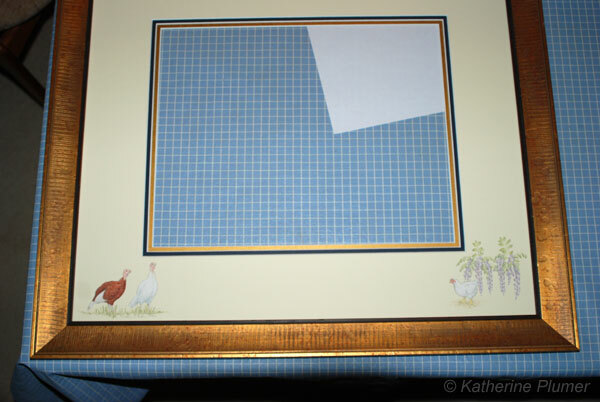 I shudder to think how much it's going to cost me to frame "Thankful" (the almost life size horse head portrait). Gulp! Frame prices have sure gone up in the last ten years. Now riddle me this, chicken people. What is this?! This bird had struck me as odd all along but it wasn't until a couple days ago that I really had a good look at it and realized that's REALLY weird. I'd just been thinking it was a birchen-ish color, but it's totally not! It's from the Golden Duckwing breeding pen. Here's a normal colored male. Note that males have the pointed neck and saddle feathers, bigger comb, etc. Here's a normal colored female, note stippled gray body and rounded feathers. Here's "it." Feathers and comb say female. Color leans more toward male. Females don't have the solid "wing bay" (the cream colored patch on the wing). 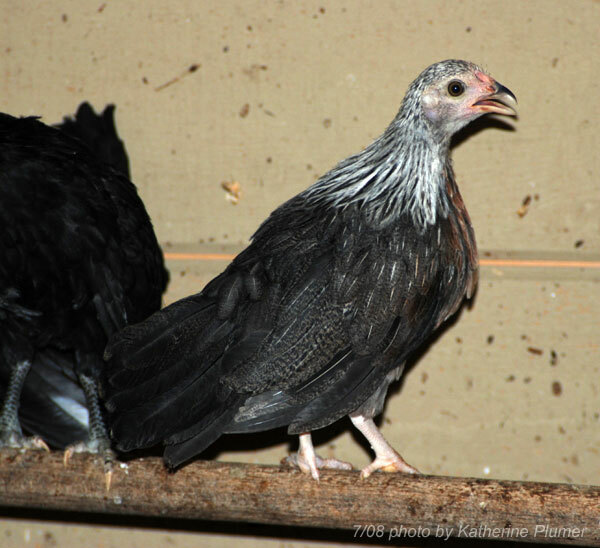 A birchen female would be more or less solid black with a silver neck. REJ, do you still read this?? Barred rocks from the feed store (future egg-flock). Right, but Anconas are freakazoids. All they have to survive here is the 8743587897345 degree weather right now, and they have to be a good influence on the Rosecombs, because unless I sell off a variety or two (possibility) they are going to end up living with them permanently! I've been pondering this mystery bird of your's for some time. Here's the conclusions I've come to. I believe it is a hennie-feathered cockeral. Further, I would guess there is birchen influence in the bird. 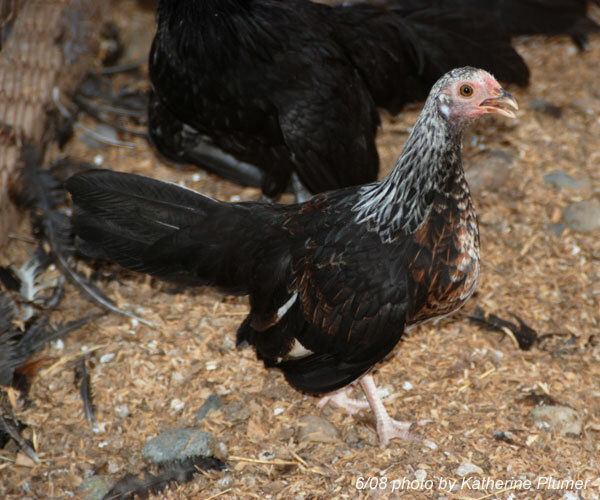 Or perhaps this bird, being impure for the hennie trait, is half-ways expressing its male color. The white markings in the breast do not concern me, as some silver duckwings are known to have such markings as immature cockerals but then molt out into solid black breasts. Below is a bird that is also a pure silver duckwing hennie. Compare and see if you come to similar conclusions.Notice in particular the flights of both birds. Hmm, that's an interesting looking bird! Birchen coloration would not be unexpected from this cross. The breeding pen was a Golden Duckwing male, a Golden Duckwing female, and a Black female. 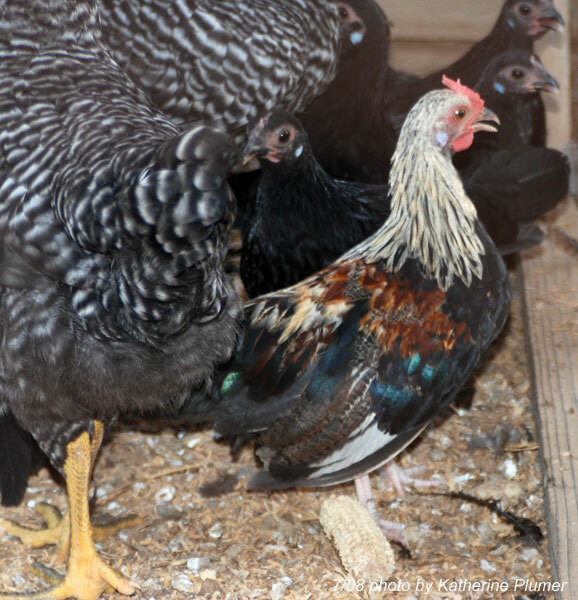 So there are solid black offspring, GWD offspring, and one Birchen (sort of) cockerel. I think I'll just have to see how "it" matures.